Let's get down and dirty with SIBO | Exactly what you need to know. 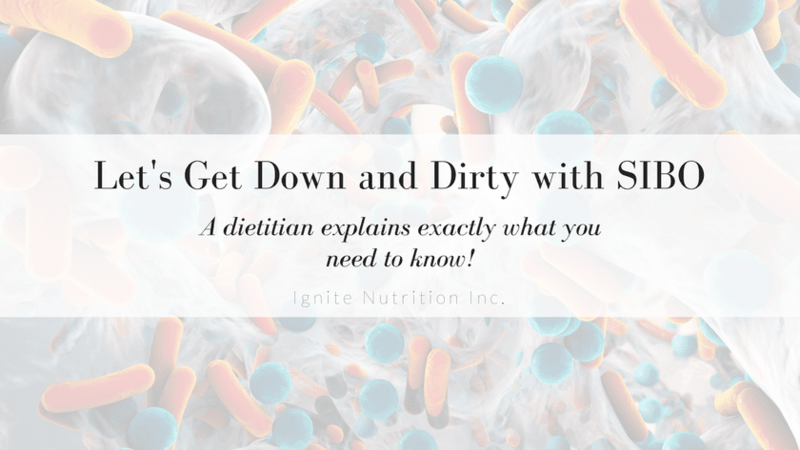 Let’s get down and dirty with SIBO | Exactly what you need to know. Home » Blog » Let’s get down and dirty with SIBO | Exactly what you need to know. I’ve been procrastinating blogging about this. Mainly because I don’t believe a one-size fits all approach works. I don’t think the research is where we need it to be for me to provide you with the ‘best’ information possible. And there is copious amounts of misinformation out there. There are things I know, but many I don’t, and while I keep up to date on the literature, the fact of the matter is, our understanding of SIBO is rapidly evolving, and what I write today, may hold less truth tomorrow. However, I did want to put it all down somewhere, where my clients and colleagues could at least get some accurate information. Because let me tell you, the misinformation is rampant. While this is based on evidence, it’s also based on my experience, a collective discussion with some of the best IBS dietitians and gastroenterologists I know, and of course, my expert opinion. SIBO stands for ‘small intestinal bacterial overgrowth’. You’re meant to have bacteria, in increasing numbers, moving from your stomach, to your small intestine, and finally, down into your colon – where they are the most abundant. They have important roles, which I often talk about in my #AskADietitian Facebook Live I host every Monday. However, when an abundance of bacteria grow in the small intestine, or certain types of bacteria dominate, you get Small Intestinal Bacterial Overgrowth. Those who appear most at risk include those with a history of food borne illness or prolonged antibiotic use, those who take PPI’s (the research is a bit out on this one – however with less stomach acid – a natural way to reduce numbers of bacteria, it’s no surprise we’re seeing it), chronic alcohol use, a history of gut surgery, those with disorders that impact the movement of the gut or the secretory actions of the gut – including IBS. Fun Fact: We’re also seeing an increase in prevalence amongst those with fatty liver disease – however it’s a bit of ‘the chicken and the egg’ scenario. This depends on the cause of the SIBO and can be highly individual based on the patient, but tends to develop over time, with the bacteria increasing in proliferation in the small bowel. What are Symptoms of SIBO? This is where things get a bit tricky. The symptoms of SIBO can often mimic the symptoms of IBS. And because of the stigma around IBS, I see many people jumping to conclusions that SIBO MUST be the real, tangible answer to their gut issue. In reality, many times my clients do have a traditional presentation of IBS, managed through evidence based interventions sufficiently. However, a certain subset of that population may have SIBO as well. 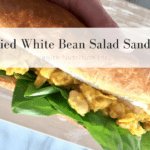 I find usually in my practice – SIBO doesn’t occur without IBS type symptoms – however because my practice is primarily IBS based, perhaps this is different. Symptoms of SIBO include bloating, a feeling of fullness, nausea, burping, diarrhea, constipation, fatigue, and brain fog. All of these symptoms are also symptoms of functional gut disorders like IBS and functional dyspepsia. How do I tell if I have SIBO? THIS is the crux of the matter. The current gold standard test for SIBO is a small bowel aspiration and quantitative culture. This is not practical and quite invasive. I have not seen it done routinely, or at all in Calgary – however – I haven’t seen everything and everyone – so perhaps it is done on occasion. Our second option, much less invasive, less expensive, but less accurate is hydrogen breath testing. The PROBLEM with hydrogen breath tests come down to the accuracy – which I think a lot of people fail to understand. Depending on the substrate used, hydrogen breath tests catch 30-70% of the patients who are ACTUALLY positive for SIBO. This is called the ‘sensitivity’. The ‘specificity’ or how many times the test accurately diagnosed as negative when the person was actually negative, is anywhere from 40-80%. Guys, that’s prettttttty bad odds. That means that anywhere from 30-70% of patients are being missed for their SIBO diagnosis, and 20-60% are being diagnosed, when they don’t actually have SIBO. With rates like that, you’re probably asking: why would we do these? Because they are ONE piece of the puzzle in the clinical picture. They’re not the be-all and end-all – however they can inform our diagnosis and treatment. My challenge is, people are receiving these tests out in the community, willy-nilly, as a definitive diagnosis – and potentially, being unnecessarily treated, or under-treated. This isn’t to say I have all the answers. I don’t. However, I do encourage people to make sure they’re getting well-rounded care and ensuring that they have considered the more likely, and obvious diagnoses before jumping to ‘oh you have leaky gut’ or ‘oh yes this sounds like SIBO’. Guys. We’re talking here about IBS – the elephant in the room that affects 20% of Canadians yet we seem to feel it’s not a real condition with real treatment options. But I’m not on that soap box today so I’ll leave that alone. (but if you want to read more about IBS, do so here, and here). Ok guys. I’m going to give you a bit of tough love here. Are you self-treating or have you self diagnosed? I get it. In a recent IBS.net survey looking at 1000 individuals with IBS, 38% were not currently seeing a health care professional, with 32% of those choosing to manage on their own, and 27% not finding health care professionals helpful in treating their IBS. Nearly all (98%) tried at least one diet strategy. Most respondents report recognizing the triggers for their IBS, but still found it difficult to manage symptoms, with only 2% indicating they were able to adequately manage their symptoms. 2% of people found adequate symptom management! THAT IS NOT enough people. My practice rule of thumb is, 75% of our IBS’ers should feel 80-90% better with PROPER health and lifestyle intervention. The remaining 25% should be considered for alternative diagnoses, like SIBO (but often times a slew of other things based on your symptoms, what caused your IBS to begin with, and your other IBS factors – including the role stress, anxiety, and the gut brain axis has on your gut!). Bottom line: If you’re trying to manage on your own, and you’re not getting better, you need to involve a dietitian or health care professional who practices in IBS & gut health. The majority of my patients who come to me sub-optimally managed end up optimally managed on diet and lifestyle changes, without us ever needing to consider SIBO. OK I’ve done all that – do I have SIBO? Perfect. At Ignite, our principles are based in intervening on the most evidence-based approach to manage symptoms first. This takes into account our four pillars of gut health, followed by symptom reassessment. At that point, your RD or gastroenterologist will take a FULL look at your clinical picture. Interventions tried, percent symptom improvement, labs, the underlying cause, or what I like to call the ‘trigger event’ that started these symptoms for you, pros and cons of testing vs treating, etc. From there, we work with your physician or gastroenterologist at the diagnostic testing, and how we can best confirm for you that testing or treatment is a good option. It takes a village! OK we’ve decided to treat, what does that look like? Standard therapy is typically antibiotics that specifically target the bacteria in your gut, or specifically target a certain type of bacteria. There are some herbal options that there have been small studies on, and though not as efficacious as the antibiotic therapy – are an option. Alternatively, there are a few small scale trials looking at the elemental diet as an option to manage SIBO. Again, this is something that would be under the discretion of your doctor, and under the guidance of a dietitian. 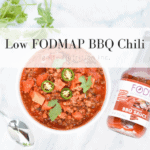 In terms of diet, a modified low FODMAP diet may be helpful to manage symptoms and to stop fuelling the bacteria in your small bowel. Depending on the underlying cause, the risk of relapse is quite high – so managing the underlying problem is KEY. That means understanding how this started, and how we can best manage it long term. SIBO – the tough reality – with hope on the horizon! When I explain it to patients and doctors, I always say, the reality is – our tests aren’t great. Our treatments aren’t great. However, if we approach what COULD be SIBO from a logical perspective, ensuring that all other TREATABLE conditions are managed or ruled out, then we could have a stronger basis to test and treat. Otherwise we’re just taking a shot in the dark, unnecessarily prescribing antibiotics, and often times, seeing clients re-present with the same symptoms. Ultimately, research in this area is still relatively new, and we’re learning more each day. We’re awaiting more literature, and more studies so that we can learn more about this condition and how to best manage it! Questions? Be sure to email us, or join us for #AskADietitian Live every Monday at 9 am MST!